With more than 250 caves, the Alburni Mts represent one of the most important karst areas of southern Italy. The backbone of this ridge is constituted of Mesozoic-Cenozoic limestone with limited outcrops of Miocene siliciclastic formations and internal shale units, often trapped in elongated downthrown structures. NW-SE- and NE-SW-trending faults with a clear morphological expression are responsible for the genesis of a squared framework of flat-topped ridges and flat-bottomed valleys at the top of the massif. In an approximate way, the Alburni Mts can be described as a roughly NW-SE-trending monocline, dipping toward the SW, covering an area of about 350 km2. The fault system has partially disrupted an ancient flat landscape, as testified by the widespread fragments of the southern Apennines late Pliocene – early Pleistocene summit palaeosurface. 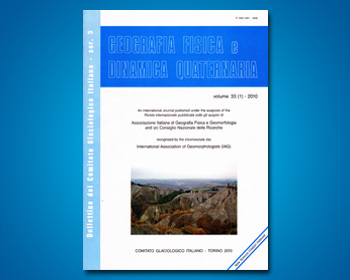 This work aims at understanding the role played by tectonic structures on karst development based upon a morphometric analysis. We also try to constrain the age of the karst phenomena using the relationships among morpholineaments, land surfaces, and other morphotectonic markers. New data, besides confirming the role of the map-scale faults as a controlling factor of the surface and hypogean karst development, also highlight the strong influence of the small-scale faults and pervasive jointing. Further, the presence of different levels of hypogean karst seems to trace the arrangement in several orders of land surfaces, thus suggesting a discontinuous lowering of the (relative) erosion base level due to a multi-phase tectonic uplift.